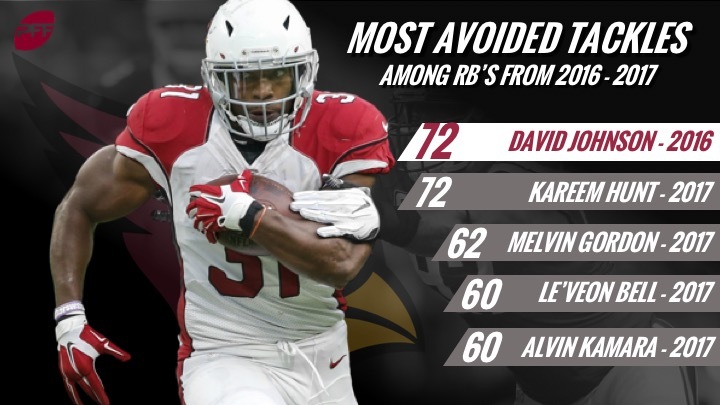 Arizona Cardinals RB David Johnson has already experienced the severe highs and lows inherent with playing professional football in the NFL during his three-year career. As a rookie third-rounder from Northern Iowa, he burst onto the scene towards the end of the 2015 season for a first-place Cardinals team. In 2016, he then solidified himself as a top-level talent, fantasy football darling and offensive focal point on a team that took a step back in the standings. Entering 2017 with a full head of steam, Johnson suffered a season-ending wrist injury in Week 1 after only 46 snaps. The Cardinals went from the fifth-highest scoring offense in the NFC in 2016 (418 points) to the third-lowest in 2017 (295 points). Let’s take a further look at Johnson’s impact on the Cardinals offense and why you shouldn’t have forgotten about him heading into 2018. In the modern NFL, running backs derive much of their value from what they provide in the passing game. In Johnson’s breakout 2016 season, he posted a receiving grade of 90.0, a grade that is up there with the likes of what we saw from Alvin Kamara a season ago. He led the league with 27 forced missed tackles on 80 receptions. He forced another 44 missed tackles on his 293 carries, making a huge impact in both phases for the Cardinals, earning an 87.8 overall grade, which topped the league’s running backs. In Carson Palmer’s last fully-healthy year, he consistently looked Johnson’s way, targeting him 107 times on Johnson’s league-leading 509 pass routes. Johnson impressively maintained his efficiency despite the high volume, maintaining the league’s sixth-highest yards per route run (1.73) among running backs. Further displaying his versatility, Johnson also averaged 1.7 yards per route run from the slot in 2016, the sixth-highest mark of any running back since 2006. One final jaw-dropping stat mined from the PFF database: In 2016 when lining up as a receiver, Johnson forced 13 missed tackles. In 2017 when lined up at receiver, Le’Veon Bell, Kamara and Christian McCaffrey forced 13 combined missed tackles. In addition to Johnson’s injury, the Cardinal’s 2017 season will be remembered for the musical chairs at their quarterback position. After Palmer’s Week 7 injury, the job was handled by an even split of below average play from both Drew Stanton and Blaine Gabbert. Without any discernable threat out of the backfield, the Cardinals ranked towards the bottom of the league in their usage of play-action passes, with Palmer and Stanton actually posting lower passer ratings on play-action passes verses non-play-action passes. Sam Bradford presumably steps into the starting role to start 2018 as a veteran presence who can win games when surrounded with the right pieces. As Minnesota’s full-time starter in 2016, Bradford’s passer rating with play action (110.2) meaningfully outpaced his passer rating with no play action (96.3). Should rookie Josh Rosen step in to a starting role at some point, expect him to target Johnson heavily and utilize play action to open up throwing windows in what should be a more threatening Cardinals offense, thanks to Johnson’s versatility and effectiveness all over the field. 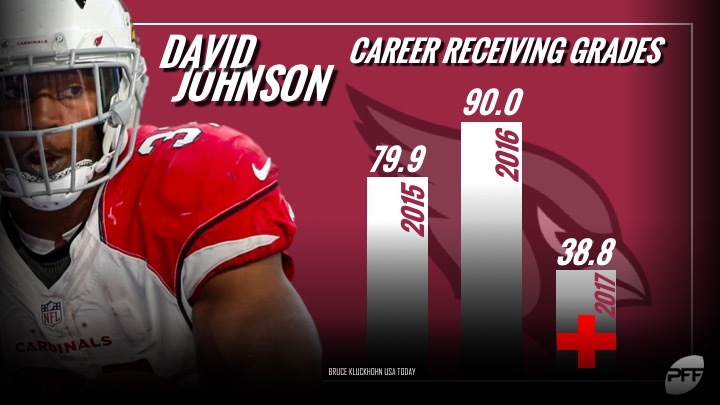 Johnson’s 2016 level of consistent impact in both the running and passing game has been rarely seen before and the 2018 version of the Cardinals offense will surely benefit greatly from his return.